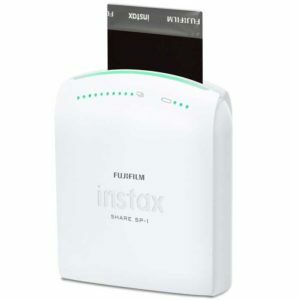 On this page we’ll be looking at the Fujifilm SP-1 Instax Share portable photo printer, this is a great pocket sized printer, which has zero ink technology. It has recently been upgraded to the Fujifilm Instax SP-2 which you can check out in our review here. If you’d like to take a look at our list of the best portable printers for more info and ideas to help you pick the best photo printer click here. In this review we’ll be checking out the Instax SP-1’s best features and we will get into how good or bad this portable photo printer really is. We will also be looking at a few customer opinions, to see what other users are really saying about this product, so expect some honest opinions on the Instax SP-1. So, we hope that after reading this review you will be able to make a better decision on whether the Instax is the right printer for you and where to find the best price for the Instax SP-1. But, if you’re in a hurry and you’ve only came to the site looking for the cheapest price to get the Instax SP-1, check the best prices on Amazon.com. You can’t go wrong with Amazon, they usually have unbeatable prices, great customer service and free fast delivery. 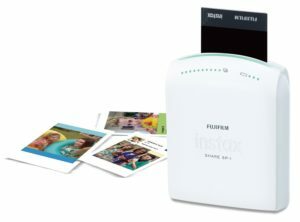 Why Buy The Fujifilm SP-1 Instax Share Smartphone Printer? The Fujifilm SP-1 Instax Share is a great printer if you’re looking for a completely portable printer. It measures a pocket-size 4 inches wide by 1.7 inches tall by 4.5 inches deep. But, this is not your standard photo printer, on no, there is no ink tank to change or stacks of blank photo paper lying around. 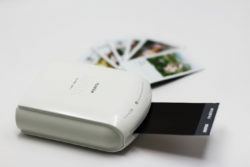 Instead it uses a similar method associated with Polaroid cameras, and it has a 10-print cartridge of instant film. 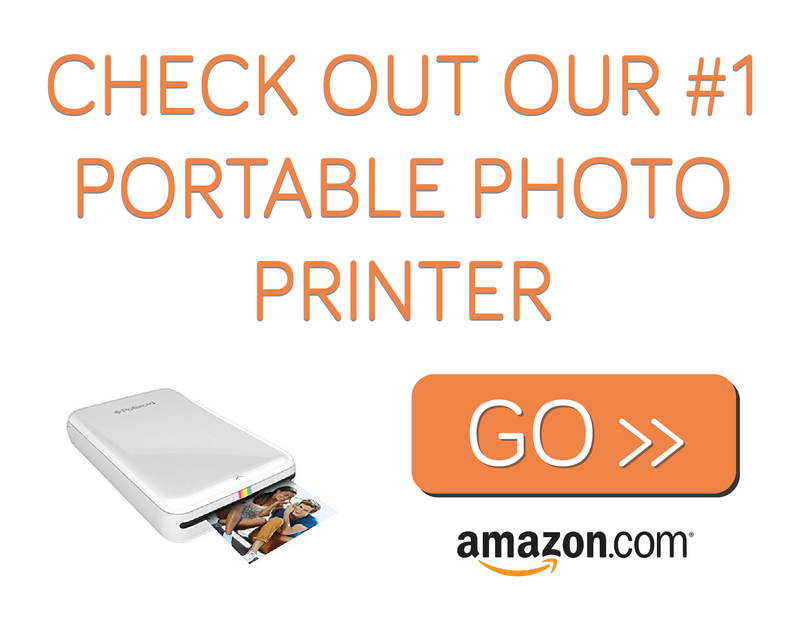 This is a great pocket-size printer but the prints are slightly small at 3.4 by 2.1 inch. So if this is something that concerns you, you may want to check out the Canon Selphy CP1200 which has larger prints and a colour display. That being said the Fujifilm SP-1 is still a great portable photo printer. Setup is super easy and the unit is totally portable when ran on the two CR2 lithium batteries, but when you’re not out and about and you’re by a power plug then you can use the optional power adapter. The printer could not be easier, it’s as simple as dropping in the batteries, adding the film cartridge, and then you’re ready to take some great shots on your digital camera, phone, or tablet and then print them. The prints have a great colour reproduction, and are sharp but still keep that retro feel we love about instant cameras, and also develop quickly and prints at a decent speed. Super easy setup and use. Compatible with Android or iOS smartphones. Fast print speed, around 16 seconds. Can be costly per print of photo. Credit-card-size prints have a boarder, similar to polaroid photos, so the actual size of print is only 1.75 by 2.47 inches. (Some may like this, we do, but we love the look of the old style Polaroid prints). We think the Fujifilm SP-1 is a great pocket-sized portable printer, as we mentioned previously the only downside to this printer is the size of print, thats if you where looking to print larger photos. 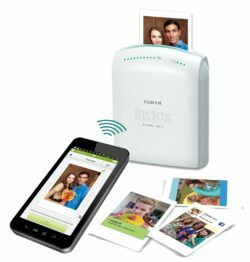 But with its speedy printing, portability and ease of use, the Instax Share SP-1 is a great pick. If you are still undecided check out our photo printer guide for 2016, where we also review a few printers that print larger photos. The Fujifilm Instax Sp-1 is great for printing your photos when you’re out and about. It has a fast printing time and is easily to power with extra batteries. But would do the actual customers and users say about the Instax SP-1? We have found a few reviews so far on Amazon.com but most of these reviews are very good giving the Instax SP-1 a great score of 4.4 stars out of a possible 5 on average. We agree that the Instax SP-1 is a great portable photo printer and is very easy to recommend to our readers.